Experience the fun and beauty of Chinese culture through Beijing Opera. The performance is a unique look into the performing art that's not to be missed on your visit to Beijing! Huguang Guild Hall is part of the "Four Great Theatres" in China, and is known as one of the most historically significant Peking Opera theaters in Beijing. Since 1807 this theatre has hosted performances by some of the greatest Peking Opera actors of all time and continues to steer the current trends in Chinese Opera. 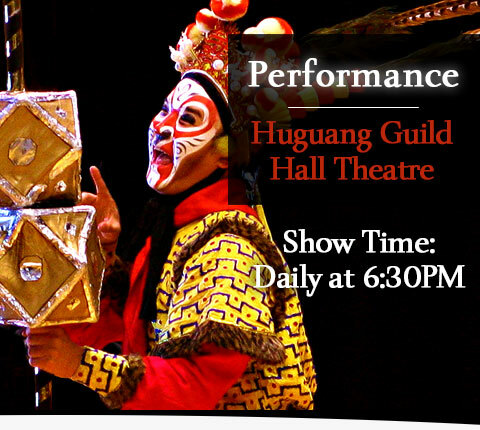 Go where the locals go and come to appreciate an original atmosphere, Huguang Guild Hall boasts with the most traditional shows in the city! With a lifetime of training, these renowned for actors time and time again amaze audiences with their unbelievable skill. Located inside a beautiful old theatre building, adjacent to an old hutong and quarters filled with old Beijing culture. Inside, you will find a museum which is dedicated to the history of the Chinese performing art.